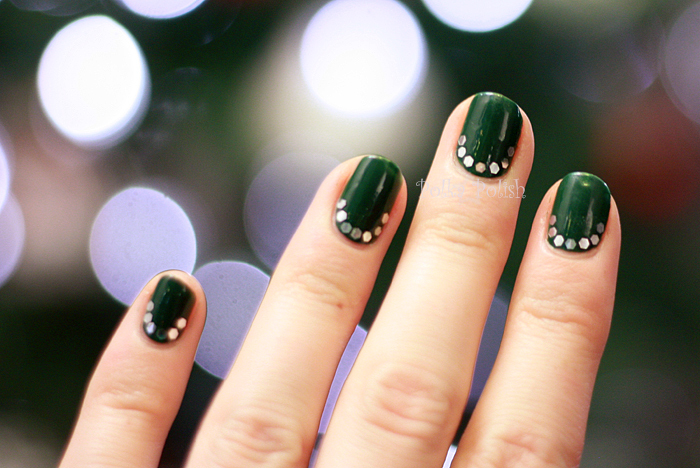 I have apparently forgotten how to blog about nail polish. This post has been sitting in an open tab, waiting to be written, for the last 24 hours. Obviously I just need to bite the bullet and write! I wanted to do something festive-ish, since we put up our tree this weekend. I also really wanted to try out some of the glequins* I won, as they’ve been sitting in my nail art basket making faces at me every time I pass them up. *Glequin (glee-kwin) is a term coined by Sammy of The Nailasaurus to describe large hexagonal pieces too large to be glitter and too small to be sequins. It was rather difficult to get the glequins on totally neatly & symmetrical-like, but it turned out that it wasn’t very obvious once all was said and done. Next, apply your chosen color. 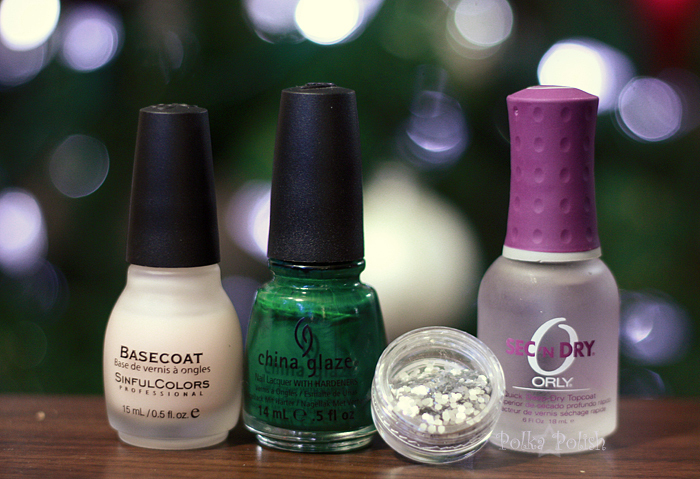 I used 2 coats of China Glaze Holly-Day, which is the perfect Christmas tree green. Really. It’s maybe half a shade blue-er than my artificial tree. Working one nail at a time, dab a small amount of topcoat along the cuticle edge where you want to place your glequins. Be smarter than me and don’t use a quick-drying topcoat for this step! Slightly moisten the end of a toothpick and use it to pick up glequins (they’ll stick to it), one at a time, and place them on your nail. Do not worry about getting the edges of your glequin semi-circle completely symmetrical. Repeat on all nails. Top all nails with a layer of topcoat. I used ORLY Sec n Dry, but a thicker topcoat (NYC or Seche Vite or one of the others I haven’t tried…) would probably do a better job at sealing in the glequins and preventing their escape. If you do use a relatively thin topcoat, try two coats. And there you have it. Should I go back to this bullet-point tutorial-esque style? When I first started this blog I wanted to include universal instructions so that people who wanted to try nail art but were overwhelmed by specific color & brand recommendations in tutorials (like myself) had access to more readily customizable instructions. Good idea? Bad idea?